Perched on the cliffs, this picturesque village is tucked away in the leafy countryside with its narrow sunken lanes edged with trees. 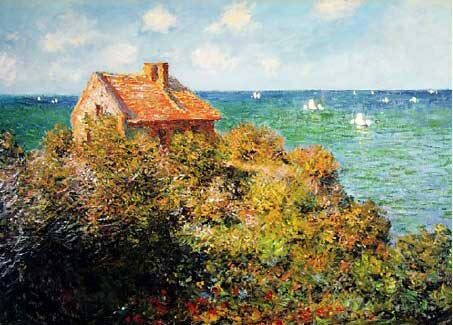 Monet was one of many artists, painters, writers and poets who came to Varengeville in the late 1800's. Monet was particularly attracted to the reflections of light on the bright sea. In this painting, the fisherman's cottage perches precariously on the cliff face and yet its roofline rises securely above the line of the horizon. Monet experimented with Japanese influences at this time, seen in the almost calligraphic brush strokes and the flattened planes of the sea and sky.